MAKE SURE YOU HAVE A PROPER SOIL PH FIRST!! This article will provide some basic information about two of the most common types of Turf Disease. Please keep in mind this article is not designed to get detailed about the fungus; this article is being written to help the average homeowner get a better understanding of some terminology regarding this problem, why it happens and how to treat for active growth. It is very apparent that most homeowners can get confused and overwhelmed when it comes to understanding why their grass is suddenly turning brown and dying when only a week earlier it looked so healthy, green and strong. Well, this article will shed some light on this sometimes humbling problem any homeowner who takes pride in keeping a green lawn will probably feel at one time or another. Lawn fungus is just one of the many variables which can affect a lawn and make it look bad. Other variables include insects, animals, lack of water and lack of food. In the United States, most people try to keep a yard which has one or two types of grass growing. Additionally, they will generally strive to keep it insect free, disease free, weed free and well manicured. To achieve any one of the above is easy; to achieve all of the above is just about impossible!!! The scope of this article is not to discuss insects, animals or fertilizing. That will be the topic of another column. This article will focus on the more common diseases which can affect just about any type of grass. Though several grasses are less likely to get certain types of fungus, given the right conditions many types of fungus can take advantage of just about any grass at one time or another. The most common grasses grown in residential communities throughout the United States are Fescue, Bermuda, Zoysia, Centipede, St. Augustine, and different types of Blue Grass. People get very sensitive about the “strain”, “breed”, “sub-species” or “genre” which is growing on their property but in all likelihood it is related to one of the grasses listed above. I don’t mean to insult or disregard any one species but there are simply too many types to list in any one article. There are literally thousands of grasses all similar in many respects but all uniquely different. Several were created for the purpose of being able to endure drought; others were created because they are more insect tolerant and still others because they are less likely to get certain disease. Regardless, if the conditions are right, any one of them can fall victim to any of the many fungus outbreaks that will occur during any growing season. Lawn and turf fungus are disease which can affect the grass growing or the soil. This article will focus on this disease. There are hundreds of diseases which can take hold of grass during the growing season. Again, the list is simply too long for this article. The most common two are Dollar Spot and Brown Patch. Both can affect any type of grass though certain grasses are more likely to get one rather than both. Dollar spot appears as small round spots, generally a few at first, which then seemingly multiply to ten, twenty or even more in a matter of a few weeks. The spots are small – about the size of a golf ball up to a basketball – and can overlap. Many people believe this symptom to be the result of some neighborhood dog urinating on their grass. Still others believe the “soil is no good” and can’t support the grass. Rarely are these the cause. Since dollar spot can occur on just about any grass (centipede seems to be about the least likely to get it) it is not unusual to see it appear throughout the neighborhood. This further misleads people of any one community into thinking there is some common culprit (anything but a fungus among us!) other than a lawn disease. The other common disease which affects most any lawn is Brown Patch. It too will turn healthy grass looking dead and sickly virtually overnight. Brown Patch is different from Dollar Spot in several ways. However, the impact it has on any turf grass is to cause it to turn brown, wilt and dry up. The marks are notably larger than Dollar Spot and generally will occur less frequently. When Dollar Spot turf begins to rebound and grow back, it is a uniform growth. Brown Patch has a tendency to grow back from the middle of the spot out leaving a round ring just before it rebounds completely. Here are some other traits of both diseases which may help to explain why you have either of the diseases. 1) Both tend to prosper in warm, humid environments. Generally the time following a rainy few days is prime time for either to become active and then visible. 2) Dollar Spot is most likely to grow on turf which is low in nitrogen or not well fertilized; Brown Patch has a tendency to grow in turf which is high in nitrogen or over fertilized. 3) Large amounts of thatch left on the yard will readily get the attention of fungus. Many people believe recycling clippings is healthy and saves both time and money. However, it definitely increases the likelihood of disease. Dead clippings are easy prey for any air borne fungus spores. It is strongly advised that these clippings are bagged during times of the fungus outbreaks. 4) Irrigation should be done late at night just before and at daybreak – not in the evening or just after dark. Furthermore, be sure your yard drains and does not hold standing water. Such conditions will allow fungus to grow rapidly. Now that you have a better understanding of lawn disease, the next part of this article will help explain how important it is for your soil to be properly balanced. Soil balance is measured using the PH scale. A balanced value is 7.0 on this scale; values lower then 7.0 are considered to acidic and values higher than 7.0 are considered alkaline. Lawns need to have a PH which measures in the 6.5-7.0 range. Since PH will fluctuate over the course of a year, it is important that you measure this value at least twice a season. Use a PH SOIL PROBE METER for this measurement. Probes work well and if you are having any problem with Lawn Fungus, you MUST measure the soil PH value prior to attempting any fungicide applications. It is so common for local PH values to drop below 6.5 and once they do, fungicide and fertilizer won’t work right. PH must be in balance if you expect any fungicide treatments to work so before you start doing all kinds of fungicide applications, make sure you know your PH is balanced. So common is a low PH that it is the single biggest reason lawns get fungus in the first place! A low PH will weaken grass and make it susceptible to drought and disease. Fertilizer won’t be processed right and in general, the grass will look bad, grow slowly and never have a chance to reach its potential. If you find PH measurements below 6.5, you will need to raise it before attempting any fungicide applications. Since it is not advisable to use granular lime during the growing season, get some LIQUID LIME for fast and quick PH adjustments. Apply it with one of our SPRAYERS and treat weekly till the PH is up to minimum levels needed. Once you know the soil PH is OK, you can proceed with fungicide treatments knowing that anything applied will have a chance to do its job. If it turns out you have alkaline soil and need to reduce your PH, you’ll have no choice but to apply granules. SULFUR GRANULES are the best way to achieve this and the 90% strength ones are as good as it gets. Be sure to use a lot of water to get it penetrating the dirt ASAP for faster results. Now that you have a basic understanding of lawn fungus and understand the importance of a balance PH, you can consider treating. There are a few things to consider regarding treatment but remember, the aim of the author is to keep decision making minimal and to avoid over diagnosing the problem. There are countless thousands of products available in the market place today and they all have their “pitch” or target fungus. However, most fungus can be knocked out with one or two products which have been around for awhile. THE KEY IS TIMELY APPLICATIONS DONE PROPERLY AND CONSISTENTLY. This sounds simple enough yet failure to follow these simple guidelines is the main reason fungus is allowed to reinfest. Let me explain. First, timely applications are applications which are done just at the onset of fungus. This is hard to do since you can’t see when a fungus first starts. The actual process is naked to the eye. Most people are reacting to the damage fungus causes – the brown spots, wilted grass, etc. If applications were done a week or two earlier there would be no damage to the grass. Traditional practice has always been to wait until you start seeing some damage but we believe that preventive applications not only work – they are well worth the time and effort! Timely applications will help to minimize damage, they will cut down on how much material you need to apply and they will lead to less material used seasonally. If you are in a region where disease is most prevalent in June, July, August and September then make an effort to treat before it starts. If you are in a region that has a lot of turf fungus problems, STRESS EYE GLASSES will help for early detection. These unique glasses are able to filter out the green color grass naturally reflects and exposes plants to appear the way they really feel. When fungus or dry conditions start and your grass becomes stressed, these Glasses will alert you to condition by showing the grass as a different color. Knowing sooner than later allows you to better respond to the situation which should help to minimize damage. This will help to limit if not eliminate outbreaks and enable you to keep fungus at bay. Treating after it has affected a large part of your yard will kill it off but not till after much of it has been affected. This means you will see some scarring. Now that you know when to make timely applications, the next step is the use of enough product and water for the square footage of grass you want to treat. It amazes the author how many people will try to “guestimate” the size of their yard. Don’t fall victim to a mismeasurement. Take some time to get an accurate count with a tape measure or better yet, use a MEASURING WHEEL. Remember, it’s not the total lot your home was built on. The needed square footage is for the grass area only. If you have an odd shaped yard, break it up into sections and then measure each sections. Square footage is simply length times width. A yard 100 feet wide by 100 feet deep would be 10,000 sq/ft. Most yards are 5,000 to 10,000 but you cannot guess at this. Take some time to figure it out and then write it down somewhere if need be. Square footage is needed when determining fertilizer rates, insecticide needed or herbicide rates. It is a number which will be needed again so don’t forget it. The third part of keeping fungus at bay is to treat the property consistently. This is just as important as step one and step two. A timely application done with the right amount of product will work but if there is no followup during the season you are subject to another breakout. The rule to follow is simple: Once you have the fungus, treat ASAP and then follow up 7 days later with another treatment. Two applications will be enough to knock it out. However, if you don’t followup with applications every two weeks to a month – depending on the formulation used – you are subject to another round of damage. This is where consistency becomes important. Another way you can monitor existing conditions is with the use of LAWN GREEN. This product is basically a grass “paint” that you mix in a sprayer and apply over damaged grass. Using it serves two purposes. First, you can add variable amounts to the mix which enable you to match the color of your grass so that when applied, the damaged grass will virtually disappear. This is excellent for cosmetic purposes. However, by painting the areas which have been damaged, you are then able to quickly tell any new spots which might be appearing. This knowledge will alert you to treat again or to make sure you got all of the yard when you treat, etc. 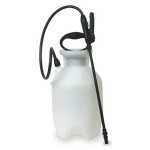 Apply it with any of the Pump Sprayers you will find listed below later in the article but the 2 QUART SPRITZER works great for this application. 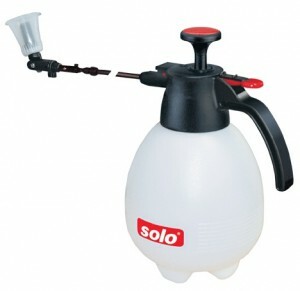 Thats because it has a tip which can be adjusted to such a fine mist that it’s almost like using a can of spray paint. The following video shows a yard with fungus damage being painted green. Now that you know about the fungus and you have an understanding of how to knock it out, here is a listing of the products you should use. AOnce the green lawnger is applied, spray HONOR GUARD. It works on a wide range of fungus and mixes at low rates too. For Dollar Spot, as little as .5 oz can be used to treat up to 1000 sq/ft so it does go a long way. Brown Patch requires a bit more at 1 oz per 1000 sq/ft and stronger rates can be used when you have a stubborn problem. 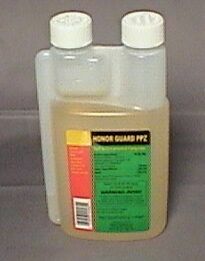 But Honor Guard works on contact as well as a systemic so its wise to get some applied before fungus starts. This method should keep fungus under control but then if any starts, apply more at the stronger rate. The strongest fungicide for lawn fungus is the ULTREX 82.5%. It can cover up to an acre and overall, is best suited for large areas with bad problems. Use a HOSE END SPRAYER to apply it. Liquid fungicides work a lot faster than other types of treatments and even though the rain can wash your efforts away there will still be a lot of benefit. The key is proper coverage with enough material and if you follow our guidelines, you will be OK. Be sure to followup with another treatment 7 days later and you should be find for at least another 2 weeks. If you don’t want any more problems be sure to treat every 2 weeks until the weather pattern changes to something which the local fungus doesn’t like. Liquid treatments can take some time and effort but they do work the best. However, if you want something which will last longer and is easier to apply, get some FUNGICIDE GRANULES. 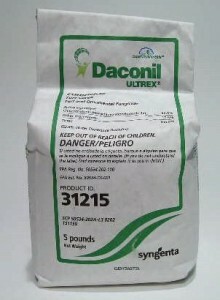 This product can be applied with one of our SPREADERS. Once on the turf it will release slowly over a 2-4 week period. It also holds up much better to rain and moist, humid conditions. The granules are also the best way to avoid getting the fungus in the first place. All you would need to do is apply some a few weeks before fungus season starts. This will allow them to dissolve and get absorbed by the grass in a kind of systemic effect. It is best to apply them at least once a month there after to prevent any outbreaks and in some regions, applying them every two weeks will be necessary. In the south where the growing season is longer than other regions of the United States, you may need to apply them from May through September. However, the average growing season where fungus will be of concern is from June to September.The point is simple – do the treatments early in the summer and you won’t get any. Lawn Fungus can cause a lot of damage to what looks like strong healthy grass in no time at all. If you don’t want to get any, treat with the Fungicide Granules early in the summer. Two or three treatments may be needed during any one growing season depending on your region. Once you have some Dollar Spot or Brown Patch, you should use the Liquid Fungicide at least twice to knock it out and then consider a few more treatments to insure it does not come back. Fungus looks terrible and weakens any grass where it is allowed to live. Keep it out of your yard if you want green healthy grass which looks as good as it can. We believe that our fungus developed from over watering as well as a low PH in our sandy Florida soil. And while we are applying fungicide to our centipede grass we don’t know how we should proceed with further watering– once a week, twice a week, deep-watering, early morning ? Second, once the PH is properly in tune, start applying one of the fungicides we have listed in the article above. And once you’ve got fungicide being applied to the grass which is growing in soil with the proper PH, it won’t much matter how much you water because the fungus won’t have a chance to grow when everything else is in tune and properly set. Now does that mean you should water daily? No way! But just how often you do water will vary from region to region. I’d say 1-2 a week should be plenty but again, this will vary depending on the season, the local rainfall for any given season, etc. Consult your local extension office (or local nursery) for more information on local water guidelines for centipede but in my experience, “less is best” when it comes to fertilizer, water and centipede grass. I recently had a professional come out to my home and told me I had brown patch. To be honest, I didn’t think too much of it last year but now almost all of my back yard has this. Several very large circular dead spots where there is absolutely no sign of grass. Once I get a soil sample to determine what fertilizers and so forth I need to apply to get a proper PH and then proceed to apply a fungicide; will the centipede grass grow back and if so about how long would this take? Or is my best bet to plant new grass? In my experience it is sometimes best to plant new sod. Centipede is slow growing and can take a season to fill in large spots. So if you’re okay waiting, no problem. But if you want to see a nice yard this year, remove some of the dead grass and then test the soil PH. If you need to adjust it, do so first. Next, install some fresh top soil and then you can lay some fresh sod. We are having issues with our grass. We had it hydroseeded about a year ago and it was growing great. During this past spring it was looking okay but I started noticing what looked like black mold on the soil in some spots. My husband waters in the morning and night daily. I know it’s being over watered but he thinks that since it looks dead it needs to be watered more. How can we get rid of this mold and how often do we really need to be watering. I live in Utah so it’s not humid and does get quite hot during the day. We are averaging high 90’s every day. Any advice would be greatly appreciated. Thank you. First and foremost, get a PH Meter and check the soil ph. As explained above, a low or high PH can cause all kinds of problems and one cannot expect to grow good grass unless this vital part of the process is correctly adjusted. I wouldn’t be surprised if this value is awry based on how much watering you’re doing. Next, read up on lawn fertilizing. It’s important to properly nourish your lawn. And based on how much you’ve been watering, I’d be surprised if there is any food left for the grass to keep properly fed. Lastly, cut back on the watering. At most you should water every other day. No doubt twice a day is extreme and I’m sure you’re inviting all kinds of problems including a whacky PH, loss of soil amendments like nitrogen and lastly, the extra moisture is surely promoting fungus growth. Now once you do all three things listed above, you can start applying one of the fungicides listed above like the Ultrex Daconil. It’s highly concentrated, won’t damage your turf because it’s a powder that’s mixed with water and since it can handle most any fungus, a good product to start with. We live in central florida and had new bermuda sod laid about 3 weeks ago. After 2 weeks, the lawn looked great. We were instructed to water 2x a week for 2 weeks, then once a day after that for a month. At 2 weeks the grass was green and thick and tall. We were going to do the first mow that weekend. When we got up Friday morning, the entire lawn was brown with the exception of a few sprigs of green intermingled. The lawn service dignosed and treated a fungus and says we will have to see what comes back. The sod company says its no big deal and it will come back. 1 week later, no regrowth. Are we out a bunch of money on this one, cause the sod company doesn’t seem to care? What can we do? So first and foremost, you need to check your soil to insure it’s adjusted right. Get a PH Meter for this. Once you know the soil’s PH is fine, I would say to water 2-3 times a week this year. New sod definitely needs a lot of water and since it was put out in the middle of the summer, cutting back to once a month waterings would not be enough. This would be true for every region in the country so I’m thinking you may have misunderstood something. Lastly, once you know the soil PH is okay, you should also start treating with one of the fungicides listed above. This will keep the fungus away for the remainder of this year and if you get your PH adjusted properly, next year you should be back on track for a more successful lawn season. Our collie just died from fungal pneumonia. The vet said he most likely contracted the fungi from the dirt in our mostly completely grass-covered backyard. He said bird feces can cause the fungus which the dog inhales. My question: Is there something I can do to kill this deadly fungus that is in my yard? 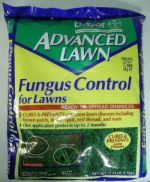 No doubt there are treatments you can do to help minimize fungi growth in the yard and home. And by reducing such growth you’ll be reducing the odds of a family member or family pet from getting sick. The bottom line is that fungi represent the single most abundant form of life on Earth. And many species of fungi are toxic to other forms of life. So to quickly sum up the problem; there are species of fungi which can affect insects, others that will affect plants and still others that can affect mammals. And for obvious reasons the fungus that can directly impact mammals are the ones which can make people or animals very sick. Unfortunately there are so many species of fungi its not possible to formulate a treatment that can kill every type for every location where they might grow. The good news is you can most definitely take corrective action by using a general turf fungicide throughout the warm season. This is when fungi are most likely to grow and such treatments will radically reduce the amount of fungus growing in the treated areas. This is the most practical way to deal with fungi problems and overall has proven to be highly effective for reducing unwanted and sometimes dangerous infestations. Next, if you review the information above, you’ll learn that our super concentrated Daconil is about as strong of a formulation available so I suggest you use this material. It will cover the broadest fungi range and should provide the largest positive impact for your turf and garden areas. Is it necessary to continue anti fungal preventative treatment in September (North Carolina)? Lawn fungus is active in our region from April through October based on our local temps and humidity. This is true even though you may not see damage, etc. So to best maintain and defeat fungi problems, treating during this time span is suggested and will often times help promote a happy and green lawn.